Is Fuel Containing ETHANOL Safe For My Classic? We are positive you have read or heard about issues regarding the use of ethanol blend gasoline in Classic vehicles. There may be as many Classic owners who haven't had problems using gas containing ethanol as those who have, but everyone who owns a Classic should have the best information to determine what DEFINITELY MAYBE means. In 2011, the U.S. EPA approved the use of 15v% ethanol (E15) in 2001 and newer automobiles. However it does not apply to automobiles manufactured before 2001. The following information is only applicable to fuels containing up to a 10% ethanol/gas blend. As no two cars are the same, it should only be used as a guide. Ethanol is an octane booster, but it also adds additional oxygen into the combustion cycle. This causes carburated engines to run LEAN. Running a lean fuel mixture will increase the engine operating temperature. If the cooling system of your Classic is in excellent condition, but you are still observing high operating temperatures, you may need to make mechanical changes. Because running TOO lean will lead to mechanical damage. The additional oxygen of a 10% ethanol mixture is about the same as running your Classic at 1,500 ft. of altitude vs. at sea level or about the same as changing a carburetor jet to one size smaller than optimal. Most properly tuned engines can withstand this change without a severe loss of performance or mechanical damage, but it does not mean EVERY Classic can. Parts of the fuel system of your Classic may not be compatible with fuel containing ethanol. This includes everything from your fuel tank to the carburetor. If you are preparing to update parts of the fuel system, NOS parts and those manufactured before 1980 are unlikely to be compatible. Gasoline is typically stable for a period of at least 90 days but may be 30 days old when you purchase it. Fuels stored over 90 days will begin to oxidize, causing a gummy build up. Therefore if you are storing your vehicle for a period in excess of 60 days you should add a fuel stabilizer. Gasoline also contains stabilizers to reduce the potential for breakdown of octane boosters. These stabilizer additives deteriorate during long term storage. When that happens the fuel can aggressively attack fuel system components containing elastomers (flexible, rubber-like parts). Over the counter fuel stabilizers developed for extended periods of fuel storage may they themselves negatively affect components containing elastomers. A gallon of gasoline containing no ethanol can hold about 0.15 teaspoon of water (at 60°F) per gallon. A gallon of gasoline containing 10% ethanol can suspend nearly 4 teaspoons of water per gallon. Temperature, humidity, changes in temperature, and how much fuel is in the tank impacts the rate at which this occurs. It would take several months of severe conditions for this to occur, but whatever level of water is absorbed and dissolved will combine into a corrosive ethanol/water layer at the bottom of the fuel tank. Technically speaking, you should be able to use gasoline containing up to 10% ethanol, but you will need to pay more attention to the fuel system, you may need to make mechanical changes, and you may have higher costs associated with the upkeep. Where can I get help if I need to make modifications? We recommend contacting your local Classic car club. You'll find a group of great people with an immense amount of collective knowledge. They will also know who to contact if you need help. 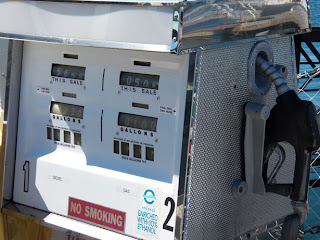 Can I buy Gasoline without Ethanol? Yes you can, but it is not available everywhere. To learn where you can purchase it visit the Pure-Gas.org website.